Linear’s intelligent line of security detection equipment is designed to eliminate tampering and theft of both personal and commercial property. Security detection products including glass break/vibration sensors and air conditioning protection systems are offered to provide security to your valuable property. Our wireless security products are able to seamlessly detect unauthorized tampering that could potentially lead to vandal or theft of expensive items. Consider installing Linear’s security detection equipment before losing valuable property to unforeseen events. Linear’s Piezoelectric Viper Plus Vibration Sensors are designed to detect glass breakage or undesired tampering of private property. The vibration sensor’s transmitting radius ranges up to 10 feet and offers the convenience of a high-low sensitivity adjustment in order to avoid unnecessary false alarms. Our Linear Vibration Sensors are designed for indoor use only, keeping them safe from both moisture and tampering. With its easy-to-use and easy-to-install design, you can be assured that your home or business will be quickly secured upon receiving your vibration sensors. Linear’s Copper Cop Air Conditioning protection system offers a completely secure solution for protecting your commercial or residential air conditioning system from theft or vandal. Installation is quick and easy when done by a professional, yet does not require an HVAC or Electrical Contractor’s License as other HVAC alarm products often require. Our Copper Cop Air Conditioning protection systems prevent copper theft, unit vandalism and can ultimately save thousands of dollars by combatting numerous incidences. We strive to offer only the best and most cost efficient options. 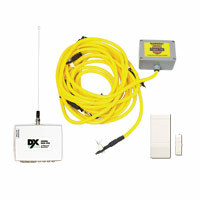 Consider contacting us today for more information regarding our security detection equipment. There are no children categories of Security Detection.